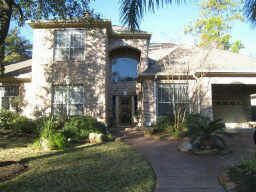 Gorgeous custom home located in the quiet gated subdivision of green trails forest! This home offers 5 beds, both formals, study w/built-ins, wet bar w/wine rm. Gourmet island kit. W/granite counters, 42 inch cabinets, & walk-in pantry. Balcony in gameroom over looks the tropical backyard w/pool, spa, & deck. Mosquito sys. Home is pre-wired for surround sound including backyard! Air-conditioned workshop in garage! Recent carpet and paint in 2009! Directions: From i-10, south on fry, left on kingland, right on conifer chase into gated community of green trails forest. Right on tamarack way, left on chinquapin place.